In honor of the new film Star Trek Into Darkness, I decided to post a map of the Star Trek galaxy. Now I’ll admit that although I’m a major nerd in many ways, I’m not really into Star Trek. I enjoyed the 2009 reboot and I’ll probably see Star Trek Into Darkness, but I haven’t really seen any of the tv shows or many of the older movies. Therefore, I won’t be doing my usual explanation of the map today. This map was originally printed in the book, “Star Trek Star Charts: The Complete Atlas of Star Trek”, by Geoffrey Mandel, copyright October 8, 2002. I can’t determine if it’s the most accurate map of the Star Terk galaxy, but it is by far the most detailed of the ones I found. One thing this map shows us, even if we have no familiarity with the series, is that the exploration of our world is far from over. Although we’ve mapped every place on earth, the Milky Way Galaxy remains mostly unexplored. And our galaxy is just a fraction of the universe as a whole. Who knows what other civilizations could be out there? 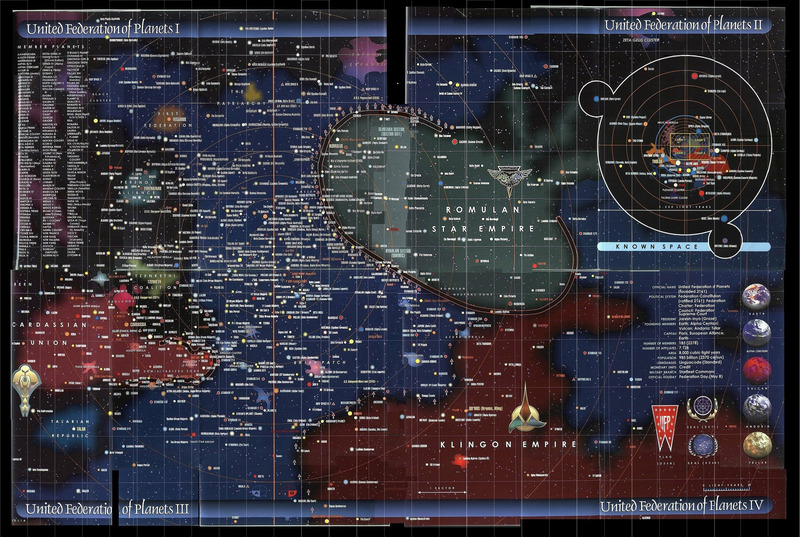 Star Trek compels us to keep looking at the sky, wondering, speculating… and, of course, drawing maps of fictional places that just might be out there waiting for us to find them.